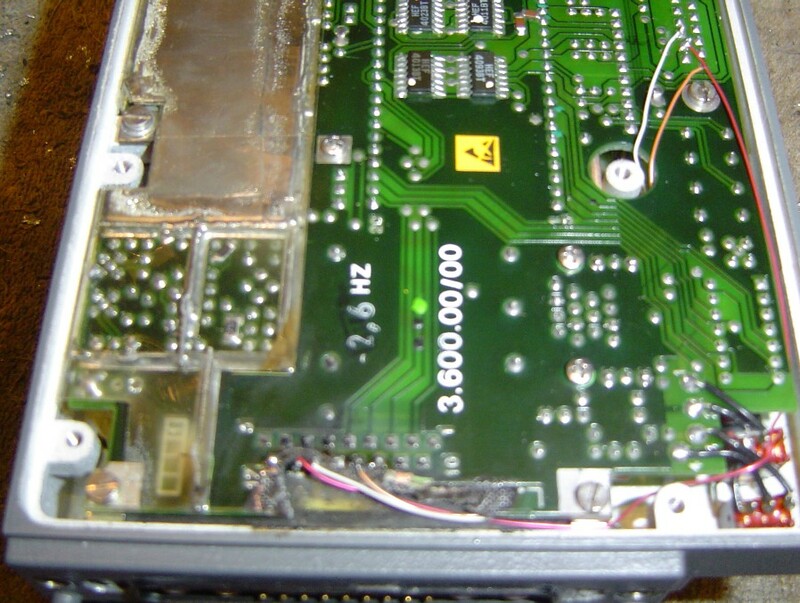 The original release of FS5000 transceivers had no Digital Control Unit. I started a project to reverse engineer a very basic unit. Some more FS5000 have been released in April 2012 which have the DCU, but they only do burst mode. My original prototype was just a connection between a computer parallel printer port and the FS5000 D25 connector. A board was used in between, with LEDs to show the line status. A control program was written in the BASIC language. This enabled the function of the lines to be deteremined, through trial and error. When the primitive functions were discovered, the circuit of a minimal interface board was drawn and the software tidied up. A piece of perf board with two DB25 connectors. Alternatively, a cable with some cross linked wires. 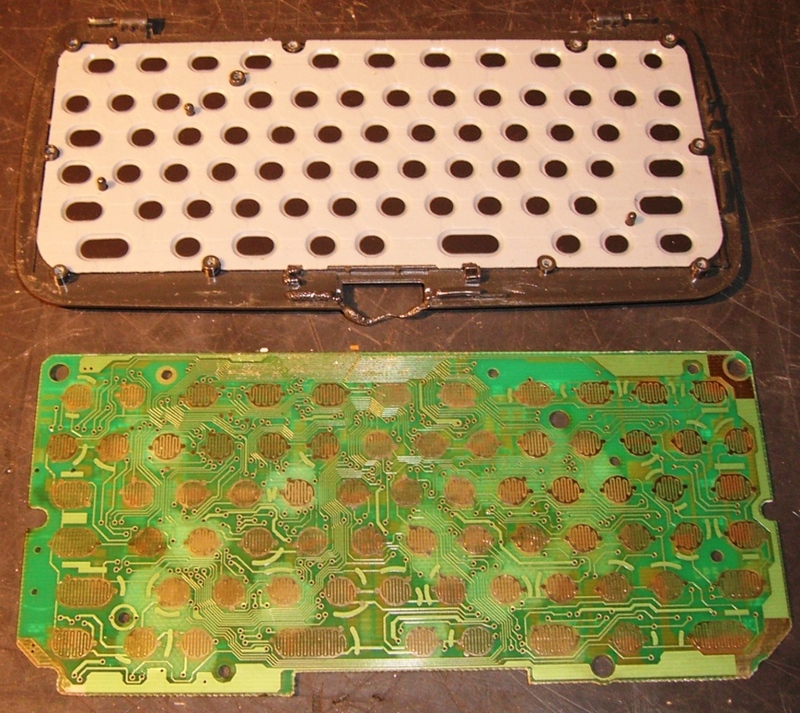 as it will destroy part of the printed circuit board or damage the FS5000 internals. and it touched the black locking levers. and on 7.025MHz at 2200 AEST. 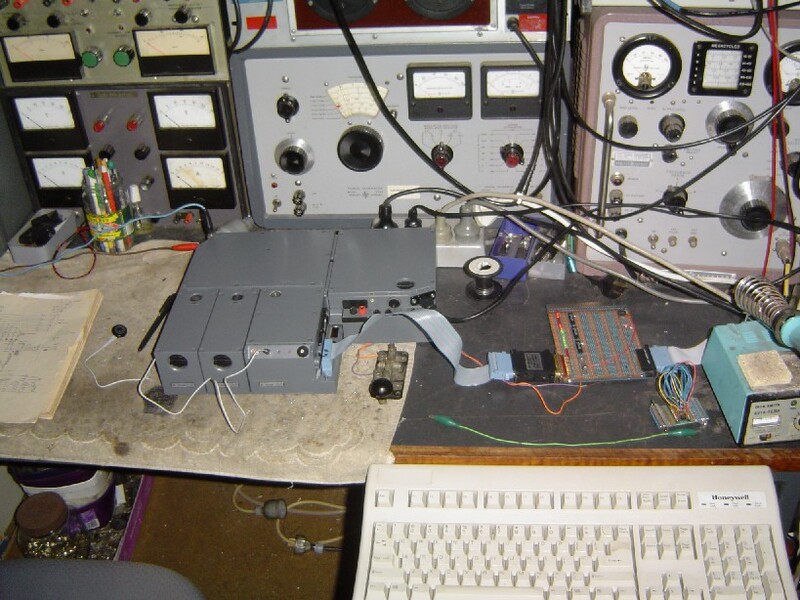 Also transmitted with an RS-1 (similar to a GRC-109) transceiver. changing from RX to TX takes about 3 seconds. changing from TX to RX takes about 1 second. I constructed a breadboard control unit using a PICAXE 40X. Programming the PCAXE. Wrote the program in PICAXE BASIC and uploaded it through the serial port. 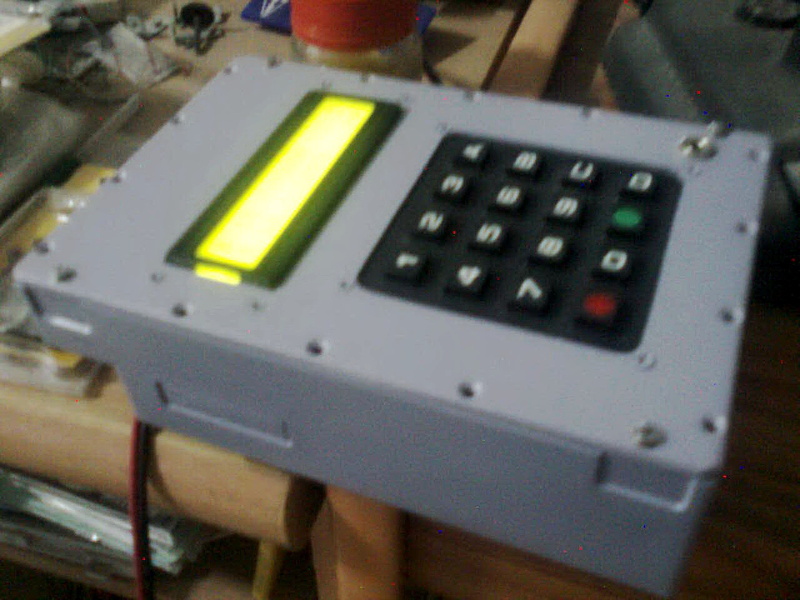 It uses an LCD display and a HEX keypad. Works well. Several bugs were found and fixed. Received a metal box from Jim (thanks very much). Cut the box and installed the LCD display and the HEX keypad. Designed and tested the morse key and buzzer circuit. Designed and tested the software ON and OFF circuits. Ordered some parts, chips, sockets, buzzer. 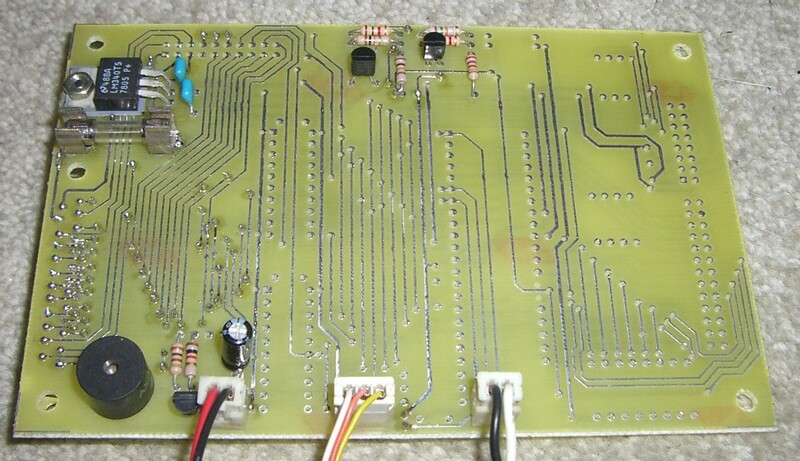 Finished PCB design in Protel. It is a 2 sided board, and using snap pins for the plate through holes. No solder mask or silk screen. Tested morse and buzzer circuits. Tested regulator and software ON and OFF circuits. Soldered in resistors, capacitors, chips and sockets. I damaged the old chip, so cannot use that. and do not show any waveforms on the external pins. my older version does not recognise the new 40X-1. Got the initialisation routines working. Should change the interface chps to 74LS374, (then have negative going latch pulses). The LCD init routines were difficult to get right, despite all the info on the NET. Wrote LCD write and title routines. Rewrote keyboard scan routines for new layout. FS5000 turns ON and OFF with A key. Bandwith changes with B key. Auto ON/OFF not working, PIC is loading keyboard lines when not powered. Transmitter working reliably, doesn't crash anymore. 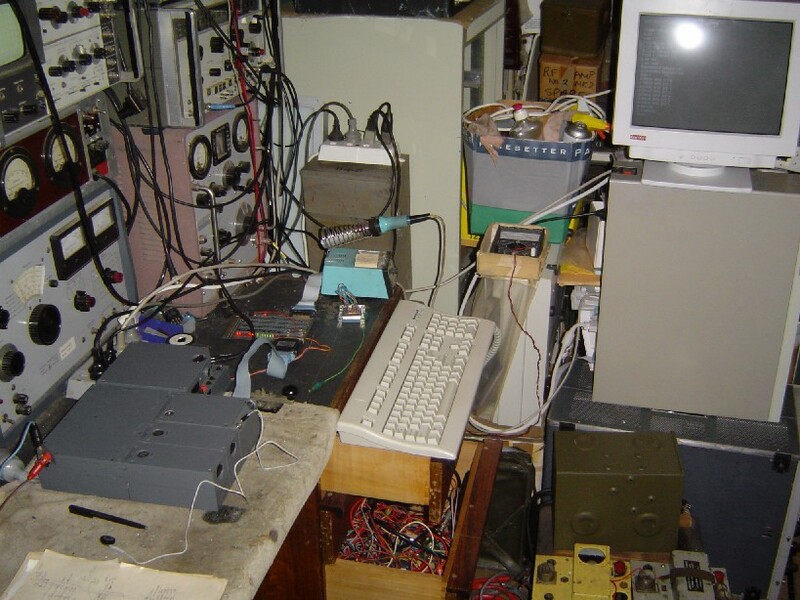 Perhaps the rats-nest layout was picking up RF causing a PIC RESET. Transmitter puts out 25 watts into dummy load. Synth Lock status displayed on LCD. Redesigned the ON/OFF routine and tested it OK.
TX and RX frequency offset added OK.
Did some on air testing, had two contacts. Sent it off to be made, they were slow, boards arrived 23 February 2010. Hole size OK for plate throughs, and ICs, just adequate for resistors. Buzzer did not work, the new ones I bought do not operate at 5v, like the design ones I used. Went to the store with a 4.5v battery and slected some that did. 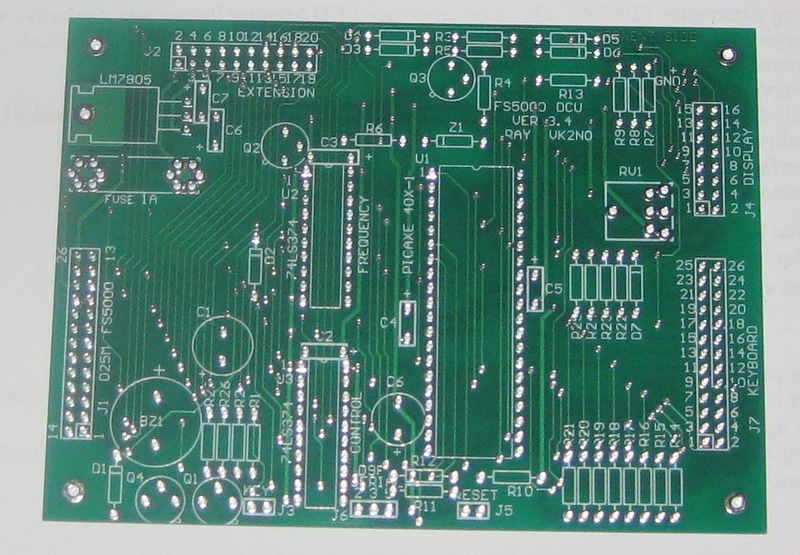 This is a downloadable PROTEL file (FS5P_4.pcb) to enable a V3.3 PCB to be made. I redesigned the morse keyer to draw less current. It now uses 2 transistors. I also redesigned the PCB. Originally I decided to flip it over so that chips were underneath, so that it leaves more clearance for keyboard and display. Changed my mind. I just made it smaller so that it fits in the bottom of the stepped DCU box. It now uses a ribbon cable to connect to the D25 connector. 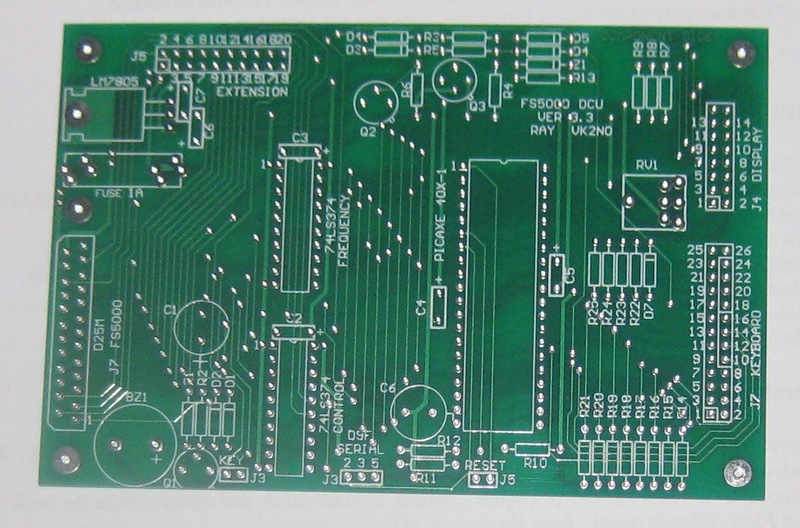 This is a downloadable PROTEL file (FS5P_6AA.pcb) to enable a V3.4 PCB to be made. 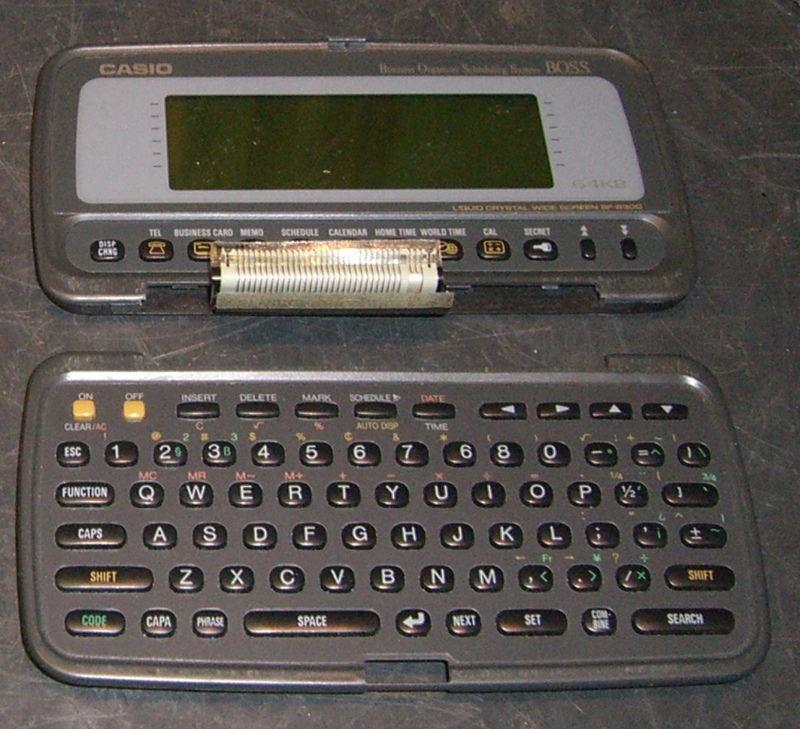 I purchased a Casio BOSS organiser so that I can use the QWERTY keyboard. Determined that the keyboard matrix is 7x12 lines (5x12 needed for PCB). 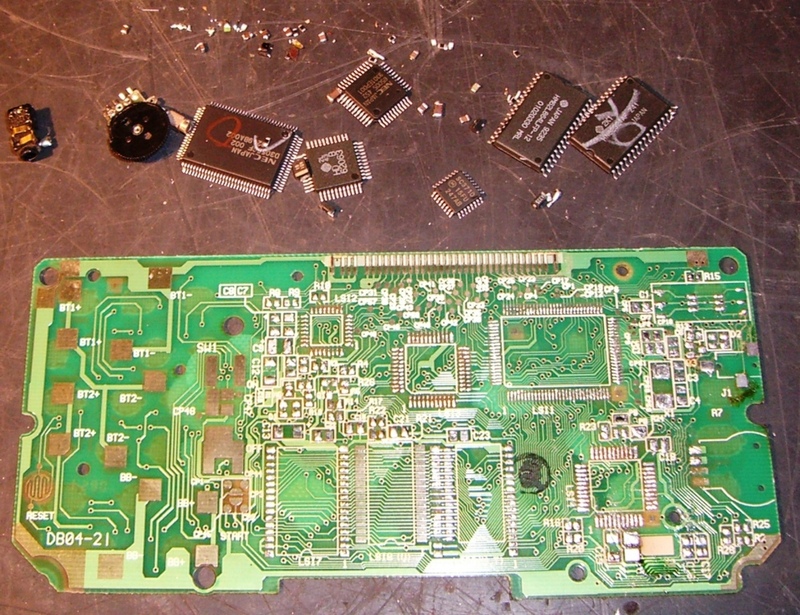 Used a hot air gun to remove the SMD devices from it. Bought some LCD displays, 2x16, 2x20, 2x40 characters. The 2x16 display works fine. The 2x20 display works fine, but it needs power pins 1 and 2 swapped on the display, (GND, +5v). The 2x40 display works fine, but it needs power pins 1 and 2 swapped on the display, (GND, +5v), and backlight pins 15 and 16 swapped on the display (GND, +5v). It is too long for the front panel. Bought a lump of aluminium, and used the mill to shape it for a new front panel. I cut a deep slot to mount the LCD. 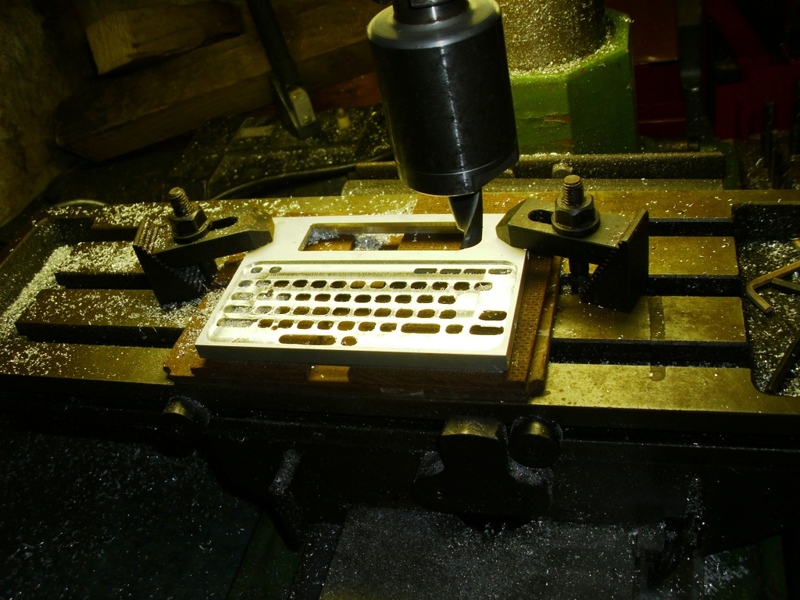 Then recessed the back and the front and cut holes for the keys of the keyboard. Photo of the milling process. Photo of the new working DCU with 20x2 backlit display and QWERTY keyboard. This uses the same software and PCB as Prototype 4, it just has a new front panel. RESET should load RX freq, it does not, why? Only tunes in 1khz increments, yet synth requies 7 digits (10hz), why? Add range checking on inputting frequency. Disable morse key and audible tone, when in RX mode or synth not locked? Investigate what the other FS5000 control lines are for. In April 2012, some more radios were released, the very similar SR5000M, and these have a DSU. I have copied the DSU EPROM, and diss-assembled the code. I have only gone a little way so far. I have found the messages for the display, and identified the LCD routines, the keyboard routines, and the frequency entry routine. - to be able to receive a message at 75 bauds. 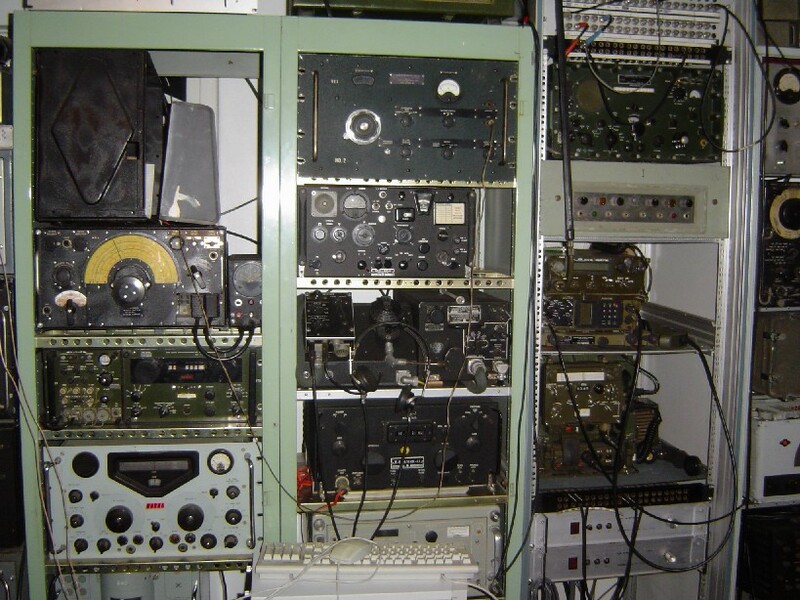 - to be able to send a message at 75 bauds. All the jumps have been fixed. Any strange bytes have been set to absolute data (using the DB assembler instruction). 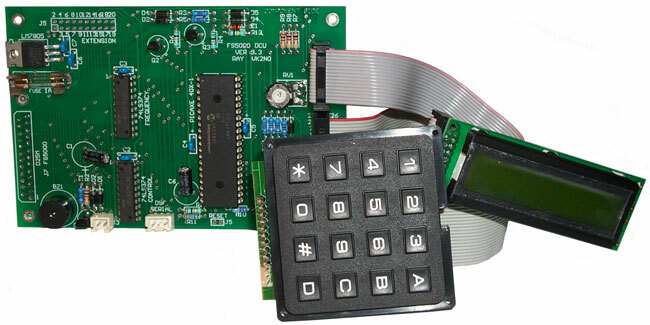 This file can be assembled with z80asm (a free Z80 assembler on the web), (assemble at address "0") and produce identical code to the original EPROM (byte for byte). This program loads a ".Z8A" file and produces a ".BIN" file, that you may be able to burn directly into an EPROM. 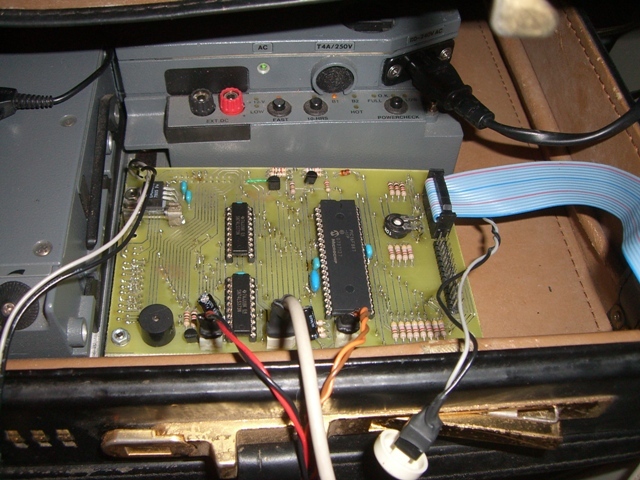 However, if you change the assembler code (even a 1 byte change), it will fail the EPROM test in the SR5000. You have to load the last byte with a checksum. I have written a program in BASIC, that reads the a "binary" file, calculates the correct checksum, and places it in the last byte. 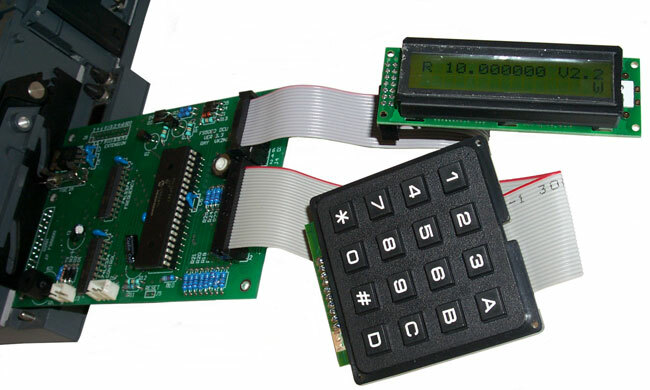 It produces a "HEXadecimal text" file and an "INTELLEC text" file, which you can use to burn an EPROM. Either file will work, use the one that suits your EPROM burner. The BASIC file is here (download BASIC program Checksum.BAS). I use the BASIC interpreter from the web called "Just BASIC v1.01". My program in not very sophisticated, and has fixed file names, so rename your files to match them, or edit the basic code to put in your filenames. In my program, the input file must be called "DSU_V1.BIN" This will write a HEX file called "DSU_VHEX.TXT" This will also write an INTELLEC file called "DSU_VINT.TXT"
An EPROM programmer called a BYTEK model S5 can load either the HEX file or the INTELLEC file, through a PC serial port (INTELLEC = format 00) (HEX = format 06). It can burn a 27C256 EPROM that will run in the SR5000. The BYTEK uses personality module TP256-C and algorithm = 0E for the 27C256. I use HYPERTERMINAL on the PC (running XP service pack 3) to "send a text file" to the BYTEK. You can maniplute the lines F0,F1,F2,F3,FC,FMAN,RXON,TDC. Here is a test version of the EPROM. It works normally, but has 2 changes. The Version number has a "t1" affixed (meaning test number 1). The station number entry routine, will only work normally for station numbers begining with 0 or 6 (so valid station numbers are 1-9 and 60-63 only). Entering a 1 as the first digit, selects the test routine. The second digit 0-7, will set that bit (high) on the D25 connector (pins 2-9). If the second digit is 8 it will clear all 8 bits to zero (low). Use the "CHANGE" key, (between station number entries) to do it again. To turn the SR5000 "ON", enter "16" as the station number. To turn it "OFF", enter "18"
Andreas has studied the DSU control and discovered their functions. 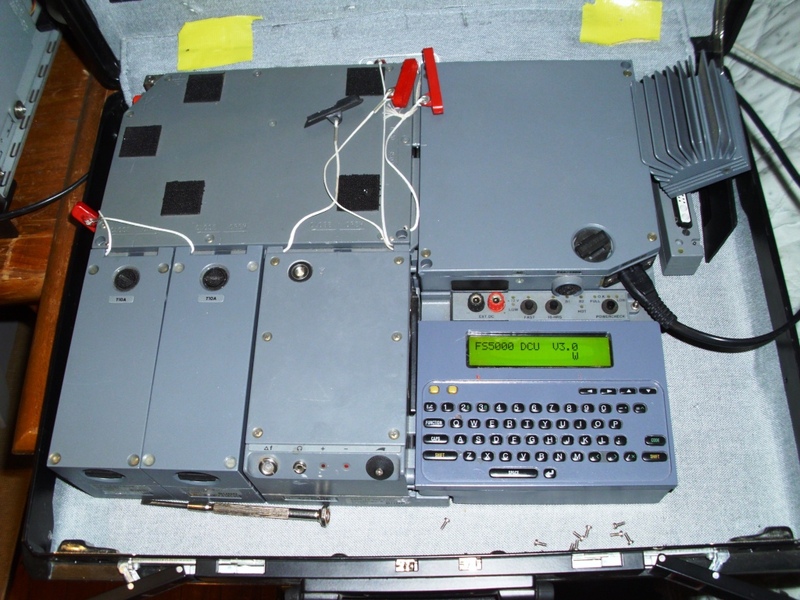 The 2 large ICs under the red paint are NSC810 peripheral inteface devices. They control the keyboard matrix, the D25 connector lines, and contain the timers. The register addresses and functions are contained in this NSC810 address file.